Last updated on February 18. I'm a graphic designer and aspiring illustration born, raised and living in the South of Brazil. 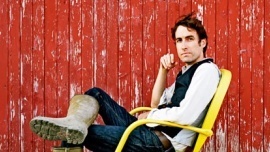 With the wind dramatically blowing his hair, Andrew Bird says hello. He's a multi-instrumentalist from Illinois focusing on the guitar, his vocals, his trademark whistling and the violin, his primary instrument, which he started playing at the age of four. 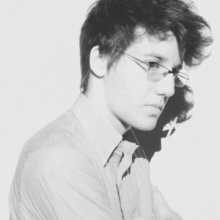 His music ranges from folk to baroque pop, with traditional folk, bluegrass, classical and jazz influences. There's a whole load of posters previously created for Andrew Bird (reaching 15 pages on gigposters.com), as he's a relatively big figure both in the U.S. and outside of it, with a rich, evergrowing catalogue. Proof of his prominence is his current South American tour, which comes about out of a crowdfunding project fueled by fans across this half of the continent (more on the Songkick Detour official website). One of the lucky cities that are soon receiving Mr. Bird is São Paulo, where I would have a chance to see him but unfortunetaly won't be able to. So I'll pay the event this little homage. "Moon plays the ocean like a violin / Pushing and pulling from shore to shore / Biggest melody you never heard before"
"There will be tables and chairs / There'll be pony rides and dancing bears / There'll even be a band" and then "We're gonna live on our wits / We're gonna throw away survival kits / trade butterfly-knives for Adderall / and that's not all / there will be snacks / There will be snacks, there will". That sums up, I think, my choice of designing a poster for Andrew Bird at Cine Joia in São Paulo, on February 23. I'll be brief: overall, the posters share the natural, outdoorsy atmosphere of Bird's music. The most recurring symbols are natural settings, cabins, wild animals, the violin, and the gramophone speaker — specially the spinning double-horn speaker, or Janus Horn (which I'll probably be avoiding, since it's already been widely explored because it's such a strong image, and very characteristic of Bird's universe). I started by mind-mapping Andrew Bird's music. The point was to try to give some sort of form to his work, to define the conceptual basis for the poster. Super bad scans follow. Not a very successful mind map. I did reach keywords eventually, though. I thought it might be a good idea to try and draw from his lyrics. There were plenty of themes, subjects and scenes there that could be translated into strong visuals for sure. So I listed some of my favorite songs, but then I realized how dumb it was to include old songs — the focus should stay on his latest releases. I narrowed it down to songs from Break It Yourself and Hands Of Glory, and from there went digging up the lyrics. Three images emerged: a ship in flames sinking (Lusitania), a beekeeper with no bees (Desperation Breeds…), and white horses in a line (Three White Horses). I kept looking for ways to explore these scenes: Which one is the strongest? How can I make it even stronger? What does it mean? Would it be right as a representation of his music? Isn't this too specific to the song? I was leaning towards the three white horses image, thinking how I could bring it to a new level. And having a hard time with it. That was until it came to me: Beyond The Valley Of The Three White Horses was playing and I hadn't noticed up to that point the crickets chirping in the piece. And I thought, the cricket fits Andrew Bird pretty well, doesn't it? A gut feeling answered, there you have it. I went on to test that idea, seeing if it matched the keywords, if it could make for an attractive poster, and what sort of symbolism surrounds the insect. There is the widespread association of the cricket with the violin. I can't for my life find the origin of this, but it's there. And before that, there is a correspondence of shapes between the two; at least I think so. It must be the long legs, which match the slenderness of the bow. There's all the chirping — it's an insect that produces highly audible sound, and it's known primarily for that. The chirp brings all kinds of associations with the wilderness. If pasture is the background of Bird's music, crickets might be on the hide. Later on I find that there are crickets chirping in Belles, too, the closing track to Break It Yourself. That was the confirmation! "Being alone, it can be quite romantic / like Jacques Cousteau underneath the Atlantic / a fantastic voyage to parts unknown / going to depths where the sun's never shone / and I fascinate myself when I'm alone"
Cricket + violin scroll and fingerboard. Found this in a parking lot on my way to work.